Scrum.org, which has Scrum as its DNA and empiricism as guiding principle, provides guidance for ‘Evidence-Based Management’ for software organizations. Management typically sets company goals and promotes organizational tactics and practices to best achieve these goals. Their decisions impact the internal organization, users and customers, and the market position. Career opportunities, internal and external satisfaction, revenues, retention, promotions, incentives, employees’ incomes and their well-being are all subject to the effectiveness of managerial decisions. It can be expected that a professional manager would regularly validate the actual result of a decision against the assumption of the decision; verifies whether, and to what extent, the decision taken actually produces the presumed outcome. Evidence is required to support or contradict the hypothesis underpinning a managerial decision. This is exactly what is promoted in the practice of ‘Evidence-Based Management’. The roots of evidence-based thinking lie in medical practice. It was found that patient health and even patient lives were needlessly at risk due to a lack of systematic use of existing research and data by and for medical practitioners. Decisions were typically based on: conventional wisdom, experts’ assumptions, theoretical studies, laboratory-only experiments, and personal beliefs. This resulted in suboptimal care and inexplicable variations in the outcome of provided services. Gathering and appraising evidence of actual patients needing treatment and receiving such treatment proved to lead to: better decisions; to a better uptake on the effectiveness of medical services and treatments; and ultimately, to saving lives. The survival and prosperity of organizations depending on software products highly depends on the value they deliver with their services. If no evidence is collected on value, informed decisions cannot be made to optimize it. Only upon evidence, are informed management decisions possible regarding the addition, revision and removal of organizational practices that influence the organization’s value. As evidence on value is outcome-related, all evidence is captured at an organizational, departmental, or product level. 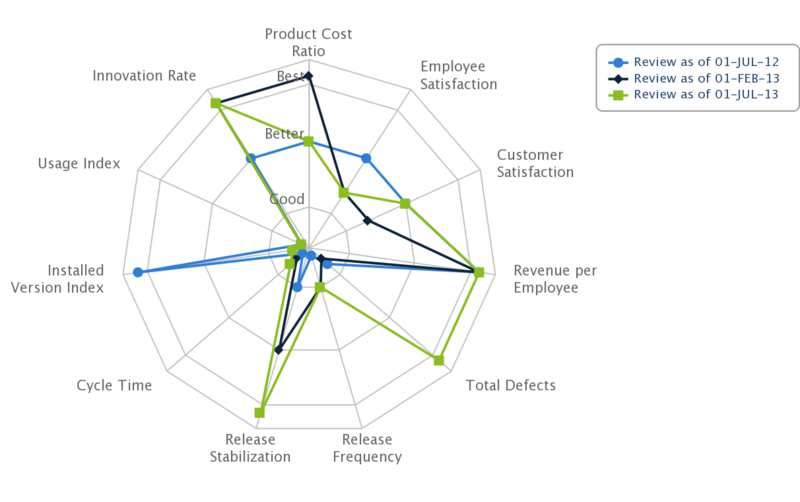 Evidence in software organizations is often wrongly collected at the individual team level; via productivity, burn-down charts, velocity or similar derivatives where there’s no direct evidence of value of the delivered services of the organization. Such evidence helps managers justify decisions about how to organize, structure, and finance improved delivery of services. The metrics are not only seen as individual data points, but represented as holistic sets. Trends and patterns can be observed, not only for the individual data but also for the cohesive sets. 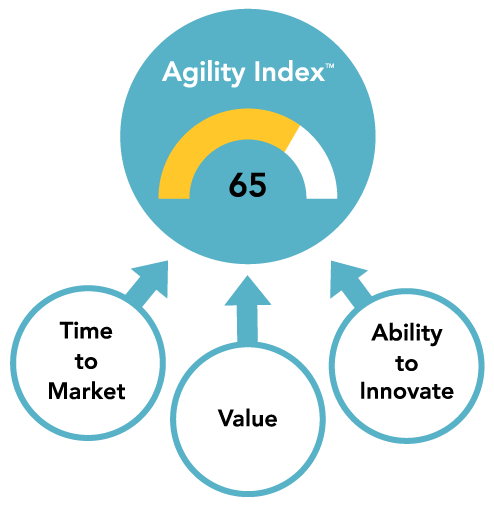 The metrics are consolidated in an overall ‘Agility Index™ -- a speed indicator of an organization’s delivery of value. Appraisal of the metrics happens against the assumptions underlying the decisions on the addition, improvement, or removal of organizational practices. These practices should ultimately have a positive impact on the outcome and be reflected in the metrics. “Process”, “Productivity”, “Value”, “Quality”, and “Enterprise”. In a context of high unpredictability and considerable change, all evidence needs to be updated and checked regularly against the assumptions. Feedback loops offering updated evidence help managers redesign organizational practices to better suit changing needs and circumstances. Evidence increases the legitimacy of decisions in the organization and the value a manager represents for the organization. 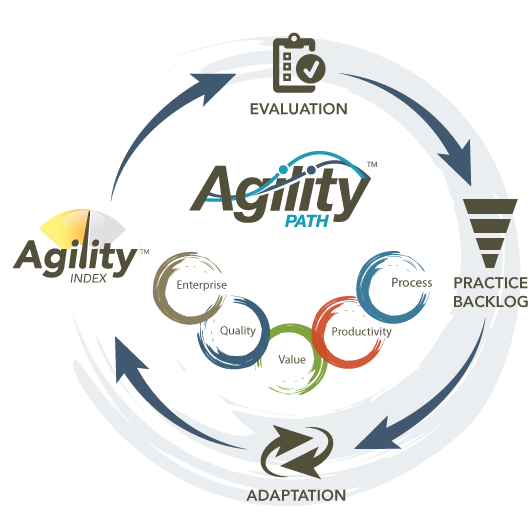 With Agility Path, Scrum.org has a framework in place that helps organizations increase their enterprise value through ‘Evidence-Based Management’.